When you think of dive watches, it is impossible not to think Blancpain! And this year, the manufacture have launched, what I think is one of the sexiest watches produced in years - from anyone, yup - anyone. So this is a tribute to Fifty Fathoms MIL-SPEC (military issue basically - 1957-58) watch. 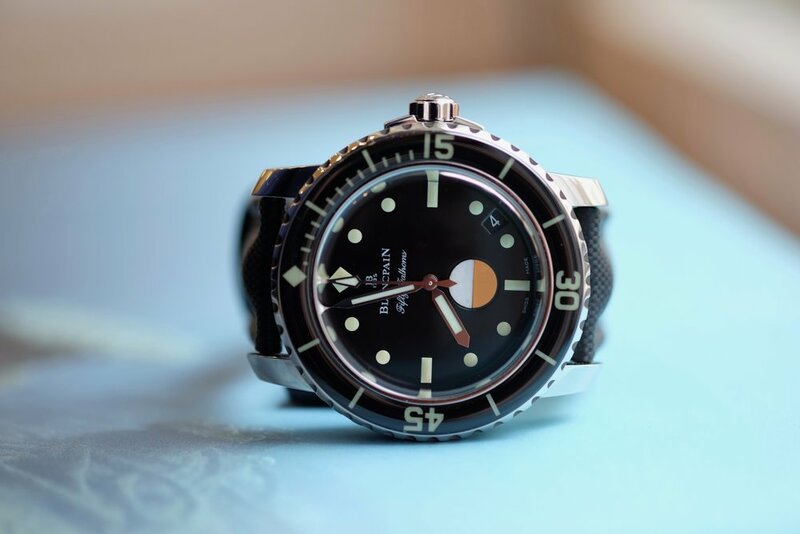 Designed for function, not aesthetic, It was in 1953, when Blancpain was able to deliver a watch to the French combat swimmers corps that fully met their criteria. The watch would go on to become one of the essential pieces of kit for any frogman worth his salt. 1. Look at it - just look at it!! It has all the features I love from the original Fifty Fathoms, but with the robust manufacturing of a modern watch. The unidirectional rotating bezel covered in scratch-resistant sapphire, a Blancpain innovation which first appeared in 2003 with the 50th Anniversary Fifty Fathoms, protects the luminescent indications underneath. 2. The unusual circular water-tightness indicator on the dial is seriously cool. If, by chance, liquid were to leak into the watch case, a disk at 6 o’clock would signal the problem by changing its colour from white to red. This water-tightness indicator was present on the dial of the Fifty Fathoms MIL-SPEC 1, which was introduced in 1957-58 to meet the strict requirements of the military. 3. The watch is fitted with Blancpain’s in-house automatic winding caliber 1151, comprising 210 components including two series-coupled mainspring barrels and offering a four-day power reserve (visible through the clear sapphire case back). 4. This watch is a comfy 40mm in diameter. Its black dial features indexes in Super-LuminNova® and a water-tightness indicator recalling the designs of the 1950s MIL-SPEC 1. 5. The watch is water resistant to 30 bar, which is equivalent to 300 meters - as you would expect. 6. It is limited to 500 examples - so your not gonna see one down the public pools anytime soon! For further info head over to Blancpain here.